Mario started his MPhys (Medical Physics) at our university in 2016. His research project was on “Evaluation of a mobile C-arm cone-beam CT in interstitial high-dose rate brachytherapy treatment planning” supervised by Adj/Prof Martin Ebert, Dr. David Waterhouse, and Dr. Pejman Rowshanfarzad. The project was carried out at Sir Charles Gairdner Hospital. Mario kindly accepted to answer a few questions about his experience in our Medical Physics research Group. Hi I’m Mario and I obtained a Master of Education in Secondary Teaching (Mathematics and Physics) at the University of Augsburg in Germany. I joined the biophysics research group to do my masters research project. We studied the manipulation of cell proliferation and migration of bone cancer cells by means of surface acoustic waves. 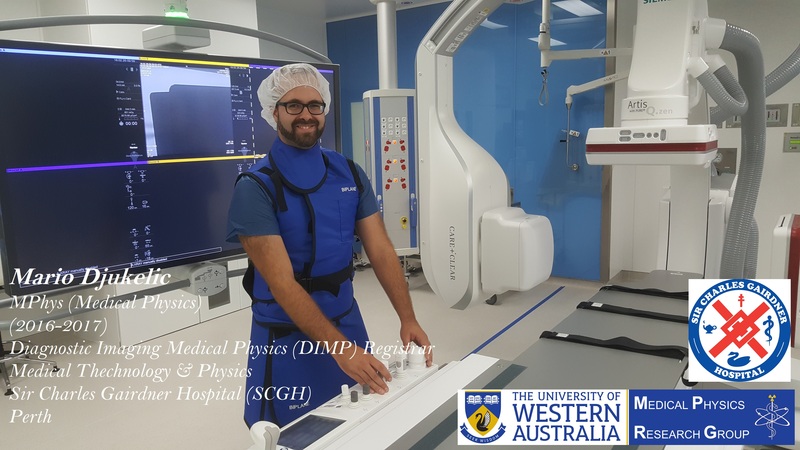 I migrated to Australia at the end of 2015, and obtained a Master of Physics in Medical Physics at The University of Western Australia in November 2017. In my masters research project I assessed the feasibility of a mobile C-arm cone-beam CT for the use in high-dose rate prostate brachytherapy treatment planning. Currently, I am employed as a medical physicist by the Medical Technology & Physics Department at Sir Charles Gairdner Hospital in Perth. In my current role, I work in the subfields of Diagnostic Imaging Physics, Nuclear Medicine Physics and Radiation Safety and Protection. For instance, we make sure that all diagnostic X-ray devices such as CT, mammography, fluoroscopy meet certain national standards. We supervise radionuclide therapies such as I-131 for thyroid cancer and Y-90 SIRT for liver cancer treatments, and ensure that the hospital is a safe place to work for all radiation workers. What did you enjoy most about UWA, and Medical Physics research group? UWA is a great place to study and welcomed me well. Particularly, I really enjoyed being part of the Medical Physics research group. Pejman and Martin are doing an amazing job in running the group. They provide excellent supervision and take their time for every individual student. 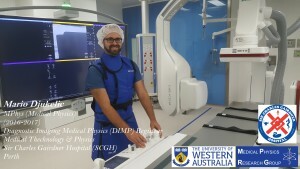 I also really appreciated that all projects were performed at Sir Charles Gairdner Hospital or Genesis Cancer Care which provides us a great opportunity to apply our theoretical knowledge from the course (mostly taught by medical physicists working in the field) to practical situations and we can see how everything works in “real life”. Moreover, we had the chance to observe monthly QA sessions on linacs and CT scanners and obtain work experience with medical physicists which was extremely valuable. Can you give us your top three reasons to study Medical Physics? How do you feel you have made a difference in your field of research? My research showed that traditional fan-beam CT scanning is not the only possible way of image acquisition for high-dose rate prostate brachytherapy treatment planning. There are plenty of alternative CT scanners on the market which can be evaluated for this purpose. Particularly, mobile CT scanners could be advantageous as they could accelerate the treatment procedure, lower the dose and ultimately increase patient comfort. What is your best advice to current students and Medical Physics applicants? Medical physics is an interesting niche in the world of physics. It doesn’t really matter which discipline you choose, i.e radiotherapy, nuclear medicine or diagnostic imaging, your physical know-how will have a direct impact on cancer research and improvement of cancer treatment which is extremely rewarding and a great contribution to society. Put some effort into your assignments even if you initially think that some parts seem to be irrelevant. Most questions are designed by medical physicists working in the field and are mimicking real situations; very valuable and it’ll eventually make sense! Also work hard on your research project and attend as many QA sessions as possible. The more practical skills you can obtain beforehand the easier the start at your new job. Lastly, be grateful to Pejman and Martin. Introduction: Interstitial high-dose rate prostate brachytherapy (HDRBT) is a form of prostate cancer treatment. A radioactive iridium-192 source is successively pushed into 15 hollow metallic needles, that are surgically inserted into the prostate, to locally deliver the radiation dose. Good quality computed tomography (CT) images are required to obtain the exact locations of the needles, the tumour target and the surrounding organs to determine an optimal dose distribution in the treatment plan. This study evaluates the suitability of a mobile C-arm conebeam CT (CBCT) as a clinical planning CT to be implemented into the HDRBT treatment procedure at Sir Charles Gairdner Hospital in Perth. Methods: This study involves a pelvic phantom analysis, various image quality assessment, a radiation survey, radiation dosimetry measurements, and a patient data analysis to assess the feasibility of the Siemens Arcadis Orbic CBCT as a planning CT. The results are compared with a clinical fan-beam helical CT scanner (Toshiba Aquilion LB) routinely used for HDRBT treatment planning. Results: The HDRBT needles in the pelvic phantom are clearly visible, distinguishable and in the presence of metallic hip replacements streaking artefacts are minimal, leading to an excellent needle localization which is an essential part of the treatment planning process. The weighted CT dose index of the Siemens is more than 8-fold lower than the index of the Toshiba CT. The in-room scatter radiation rate is very low (order μGy/h) meaning that lead glass provides sufficient protection for the staff during CBCT acquisition. The Siemens CBCT underestimates CT numbers leading to poorer tissue contrast which exacerbates the delineation of the target tumour and the surrounding organs at risk which is also an essential part of the treatment planning process. The patient data analysis showed that the CBCT based treatment plans indeed pass the typical HDR prostate brachytherapy dose constraints and additionally have a better CTV coverage and dose homogeneity. Conclusion: The presented results show that the Siemens Arcadis Orbic 3D indeed has a high potential to be clinically implemented as the image quality is sufficient for brachytherapy treatment purposes. The mobility of the scanner allows immediate scans after surgery providing a better re ection of the treatment, saving time and improving patient comfort. Treatment costs will be reduced and the availability of the fan-beam CT scanner is increased for the use with other patients. But at this stage, further investigations with more patient data are required to draw a definite and final conclusion. And here is video recorded from Mario’s final presentations at Sir Charles Gairdner Hospital about his research project and outcomes. Once again we congratulate Mario for his great achievements and wish him all the best for his future career as a Medical Physicist.